Hart District Council has begun the Regulation 19 consultation on the Local Plan. This is the final version before submission to the Inspector later this year. Unsurprisingly, this still contains Policy SS3, with proposals for the entirely unnecessary Hartley Winchook new town. The consultation run from 9 February 2018 to 4pm on 26 March 2018. The whole suite of documents can be found here. We will, of course, oppose the new town elements of the Local Plan. However, we have to take great care in opposing the plan, because the worst outcome would be that the whole plan is failed by the Inspector. Hart says that representations about the Local Plan should relate to legal compliance, duty to cooperate and tests of soundness. Helpfully, the council has provided a guidance note on how to respond. We beleive there are grounds to challenge the plan on the grounds of soundness. Overall our objective should be to get Policy SS3 removed, together with the necessary grammar changes to Policy SS1 to ensure consistency. We believe the spatial strategy is flawed, because it includes provision for the new town, which is enitrely unnecessary to meet the still inflated housing numbers. The housing numbers themselves are based on the new Government methodology. However, they have included an arbitrary 25% uplift to the requirement, which we believe is too high. 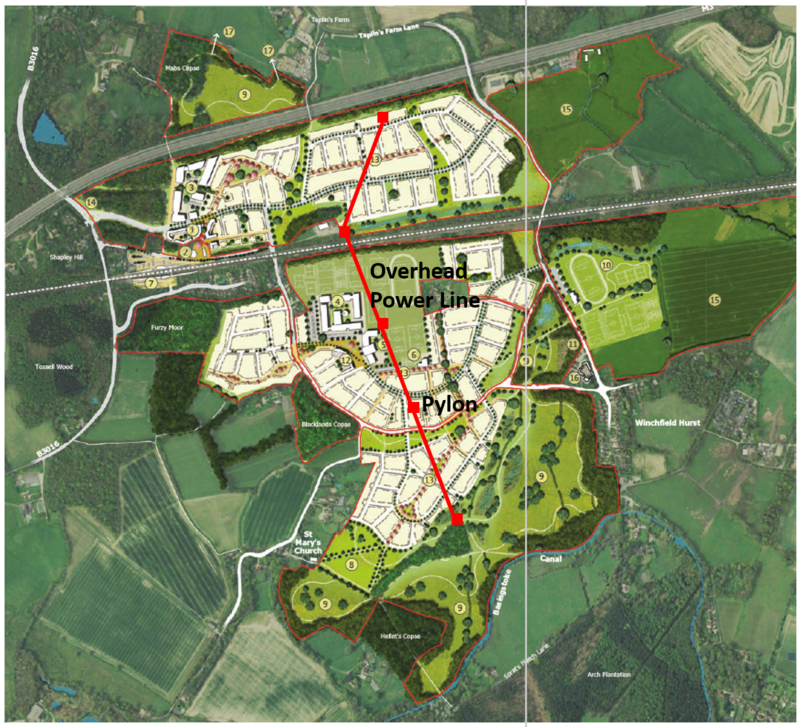 The area west of Winchfield was ruled out of the sustainability assessment, because it is a more peripheral location relative to the train station, does not offer a central focus and is in close proximity to Odiham SSSI. The area east of Winchfield fared less well that Murrell Green and of course the sustainability assessment grossly understated the flood risk. And of course there were other issues with Historic Environment, Bio-diversity, Landscape and Water Quality. The sustainability appraisal famously did not take account of the high-pressure gas main traversing the site. Moreover, it is highly likely that the costs to deliver the required infrastructure will far exceed any realistic assessment of developer contributions. Hart acknowledge that Fleet will face a challenge “to secure investment so that it can compete with the comparable towns in neighbouring districts”. Yet, the local plan contains no plans to regenerate our main town centre. The infrastructure plan is paper thin, and they offer no solutions on how to close the £73m infrastructure funding deficit and no plans in particular to improve healthcare in the district. 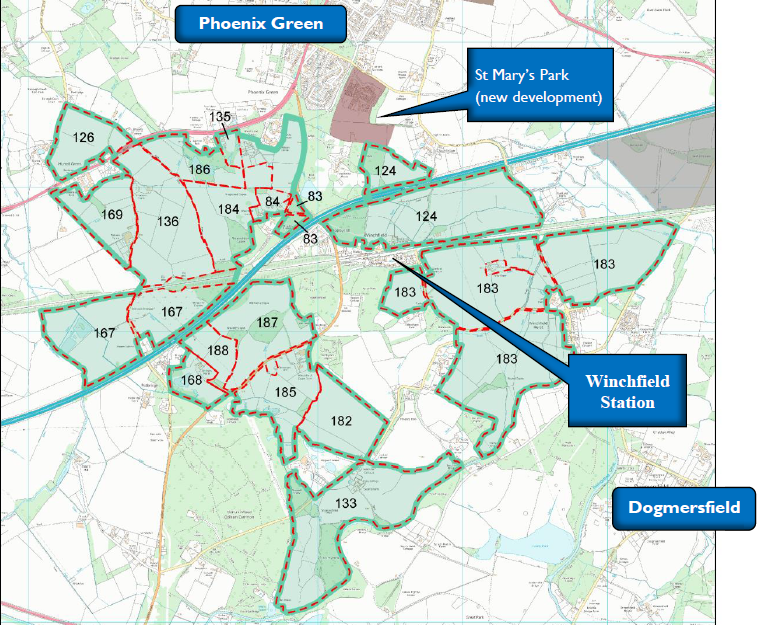 The development plan policies contain a number of strategic gaps around the district, but leave Hartley Wintney totally exposed with no strategic gaps planned. We will pull together a more detailed response in the coming weeks. 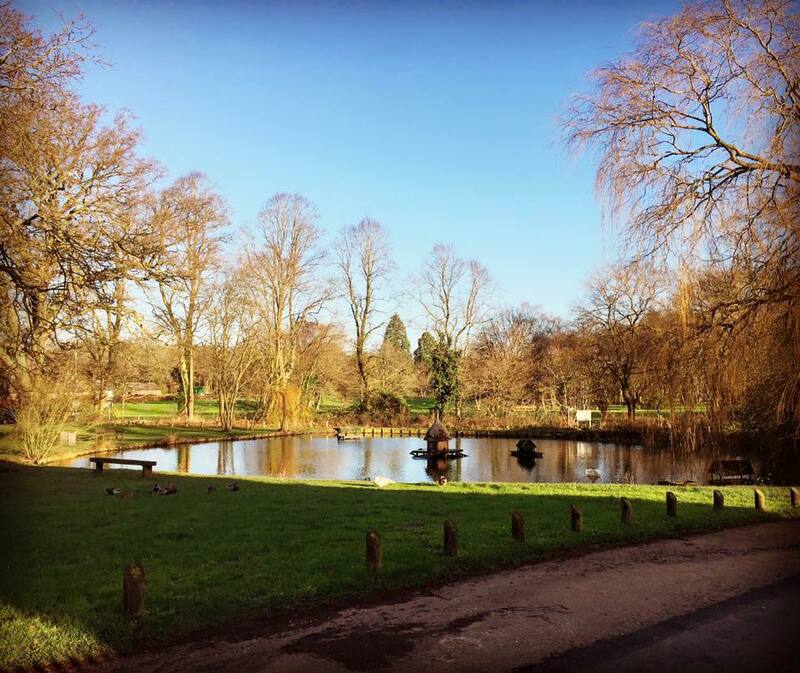 The Hartley Wintney Neighbourhood Plan team have launched the latest version for consultation. It is clear that a great deal of work has gone into this plan, so we should thank the team. I would encourage Hartley Wintney residents to respond to it positively. The consultation runs from 9am on the 8th January to 9am on the 19th February 2018. Copies of the summary and full versions of the Neighbourhood plan can be found here. The online feedback form can be found here. Our feedback has broadly welcomed the Neighbourhood Plan. However, we have made three recommendations for improvement that you may wish to consider in your own submission. Policy 7 Views. As you may know the Hart Local Plan is due to be published for consultation shortly. This contains Policy SS3 which includes proposals for a new town in an area of search including Murrell Green. I believe you should expand the field of the protected view coming from the West of the village to include the vista to the south of the A30. This might afford us some greater protection later down the line if we are unsuccessful in fending off the new town. Policy 8 Gaps. Related to the above, the Hart Local plan defines a number of strategic gaps around the district. These are shown as red hashing on the image below. 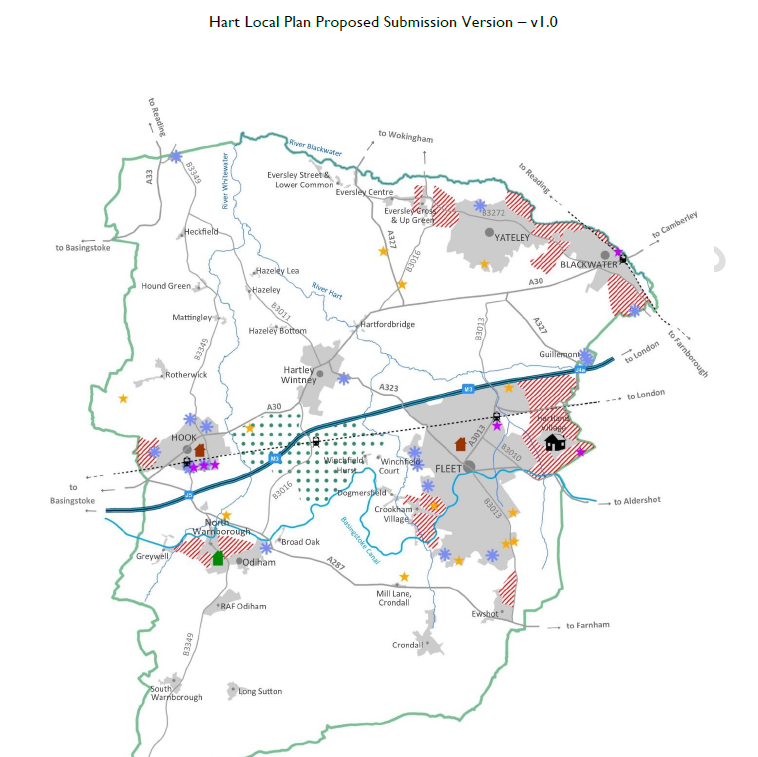 It is notable that there are no strategic gaps proposed by Hart around Hartley Wintney. I would suggest that in the absence of such gaps being proposed by HDC, then we as a village should propose our own strategic gaps, particularly to protect against visual and physical coalescence with Murrell Green/Hook to the south west and Elvetham Heath/Pale Lane/Fleet to the south east. Village Parking. My final comment relates to parking in the village and along Green Lane in particular. The village has grown a lot in recent years, and the infrastructure has not grown with it. There are times of the day that Green Lane becomes impassable due to cars being parked and other cars wishing to travel in both directions along it. There is probably scope to widen the lane between the Church and the WI Hut to allow both parking and two-way traffic. Similarly, there is probably scope to add extra parking spaces along Church Lane between Fleet Road and Oakwood school. Extra parking capacity will help those people who need to drive to work in the village. Please take the time to examine the document to come up with your own suggestions for the Hartley Wintney Neighbourhood Plan. Happy New Year to everyone. Before Christmas we reported on the details of the forthcoming draft Local Plan. 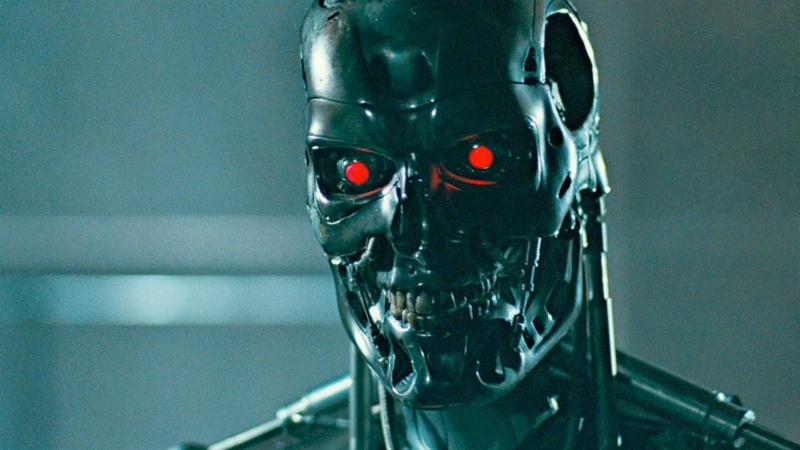 We thought the new Government approach to calculating housing need had killed off the idea of a Hartley Winchook, but it has returned like a Terminator who doesn’t understand its time has passed. The CCH/Lib Dem coalition have included plans for a new Hartley Winchook settlement in the draft Local Plan, even though a new town is not required. There are key council meetings on the 2nd, 3rd and 4th of January 2018 to discuss these plans. We would urge as many people as possible to go along an oppose this aspect of the proposed Local Plan. A new town is not needed to meet the required housing numbers. The Council have set the housing target at a generous 6,208 over the planning period from 2016 to 2032. We believe this target is more than is required, but we could live with it. A new town is not required to deliver these numbers. They have identified 6,346 homes to supply this requirement, without the new town being required. They are intending to plan for a new town that will start delivering even more new houses in 2024. This will lead to significant over-delivery of housing, unnecessarily decimating our countryside and setting an increased target for future generations. Diverts attention away from the necessary regeneration of our urban centres of Fleet, Hook, Blackwater and Yateley. We believe the proposal is misleading and potentially unsound because the area of search includes land that is definitely not available, for example Andrew Renshaw’s farm in Winchfield. Unnecessarily blights the property values of residents in the area of search, which might well be illegal. 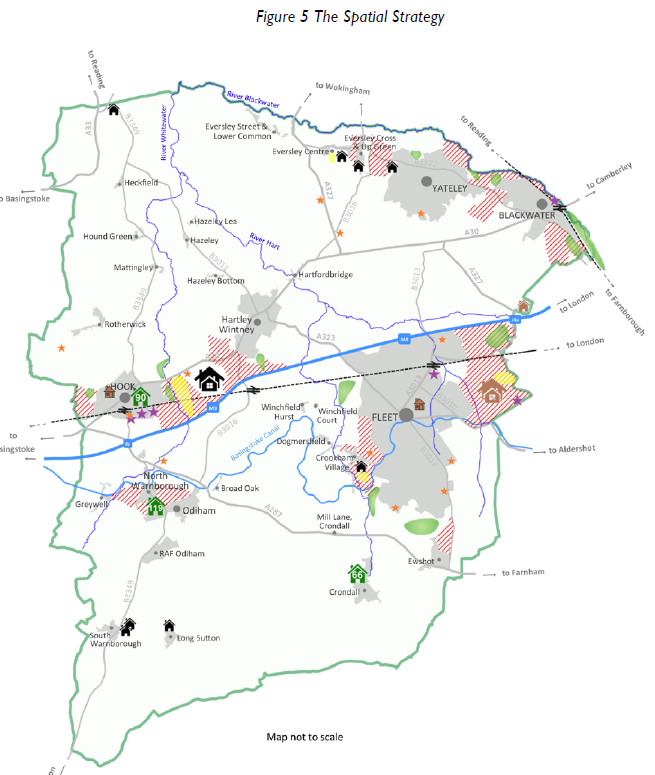 No local gaps provided around Hartley Wintney, Winchfield or to the east of Hook, (see image below). Creates unnecessary extra work and lack of focus at this crucial stage of plan development. It is imperative that the Local Plan is approved as quickly as possible. Everybody would be able to live with the proposals if the Hartley Winchook new town plan were deleted. Including it now, adds unnecessary controversy. It is time to terminate this daft idea. We are sorry that we can’t be there, as we are travelling over this Christmas and New Year period. Calderdale and Dorset councils have now both reduced their housing targets in the light of the Government consultation on the new way of calculating housing need. This comes hot on the heels of a similar announcement from Leeds City Council. Despite the Government saying it was starting ‘formal intervention’ against Calderdale for not producing its Local Plan on time, the housing target has been reduced from 17,000 to 13,000. Calderdale Council has said it will be looking at further opportunities on brownfield sites and increasing densities of town centre developments. The full story can be found here. Meanwhile, Dorset council is looking to reduce the number of homes it is planning for following the publication of the government’s consultation on a standard methodology for objectively assessed need (OAN). This story can be found here (paywall). It is time the CCH/Lib Dem coalition dropped their ridiculous new town ideology and worked to protect our valuable green fields. Sadly, there is no sign of them doing so. Community Campaign Hart (CCH) have revealed their plan to Completely Concrete Hart by sticking to the ridiculous 10,185 housing target in the draft Local Plan. This comes despite the new Government method for calculating housing need results in a much lower housing target for Hart, Rushmoor and Surrey Heath. It is time to up the pressure on CCH to come up with a strategy to take account of this new information. 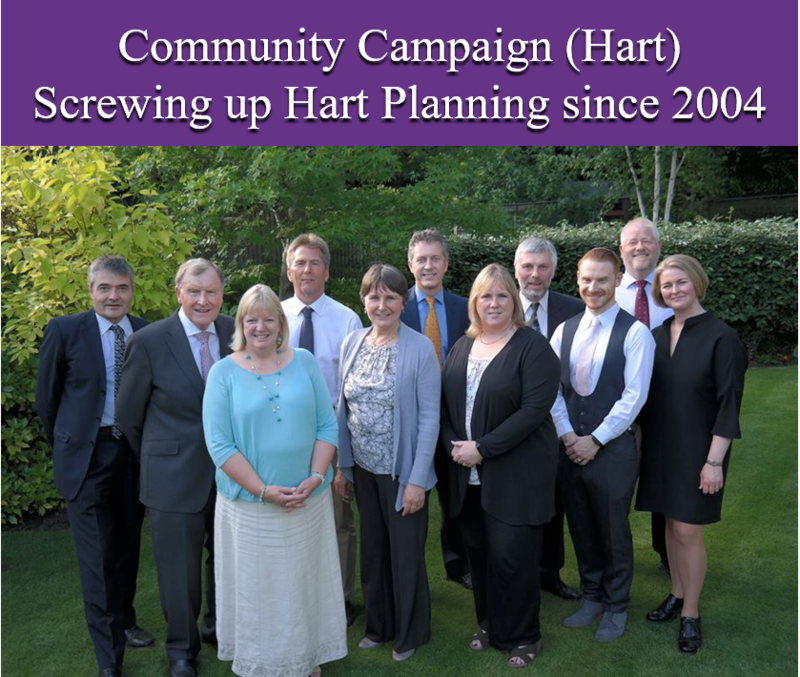 They should build a Local Plan that is good for the whole of Hart that everybody can live with. It is time to drop their plan to Completely Concrete Hart. The derelict eyesores on Fleet Road – up to 200. We can save Hartland Village (Pyestock) for the 2030’s. The revelations came in a reply to an email sent to CCH by a concerned correspondent on Facebook. We reproduce the question, James Radley’s answer and our commentary in red below. If Hart followed the latest Government approach to calculating housing need, even Hartland Park wouldn’t be needed. The remaining housing need could be met from Sun Park and any number of other small brownfield sites. I am probably the best placed to explain the CCH position on housing numbers. It is true that as a rule we do not engage in social media debates, mainly due to a lack of time. As well as trying to fit in my day job I also expect to spend over 6 hours in total in the council offices today and similarly tomorrow. One has to ask why the council Deputy Leader and portfolio holder for Services is spending quite so much time in council offices working on the Local Plan. One would hope this time would be put in by the portfolio holder for planning, Lib Dem councillor Graham Cockarill. It obviously takes a lot of effort to Completely Concrete Hart. Social media debates are very time consuming in order to stay on top of all the posts and then the debate tends to descend to the lowest common denominator. I for one would certainly rather put the time and effort in where it matters and unless one is going to invest all that precious time in the social media arena, better not to engage at all. This sounds like CCH want to stay in their own bunker and not actually engage with anyone who disagrees with them. They are afraid to engage because they don’t have any facts or arguments to back up their new town ideology. Unfortunately WHH are wrong in their assessment of housing numbers. No, we are not wrong in our numbers. Here is the relevant section of the Government consultation document. Working through this. The demographic baseline is the latest DCLG household projections (Table 406) that can be found here. 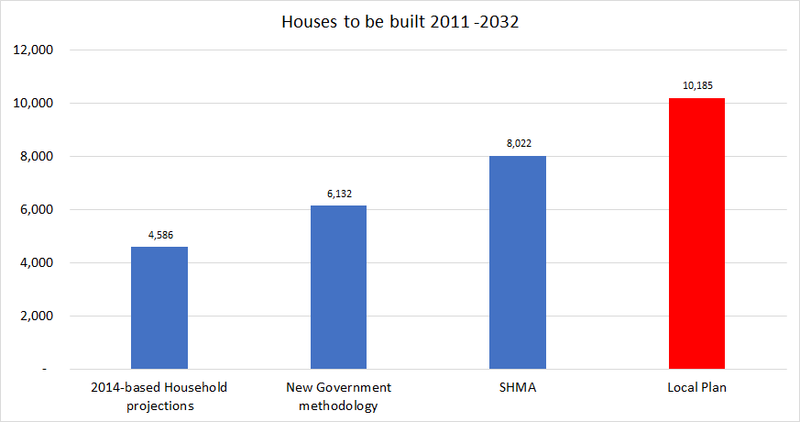 These show that over the period 2011-2032, Hart requires 218 dwellings per annum, or 4,536 in total. In the reference period of 2016-2026 used by the Government, Hart requires 209 dwellings per annum. This 209 dpa is then modified to account for market signals and results in a new Government figure for Hart of 292 dpa. Scaling up to the full planning period results in 6,132 new houses for Hart. And that’s it. No more further adjustments for changes in household size. No more houses for people we have to import who then go and work in London. This compares to the 8,022 in the SHMA and 10,185 in the draft Local Plan. They are citing a baseline figure in a government consultation paper which is not part of the planning policy framework in effect at this point in time and is a figure which even if it was policy is taken as a starting point on top of which other factors will add to the housing numbers needed. The first scenario should be based upon the 6,132 outlined above. Plus a few hundred to give some flexibility to build some new houses for Surrey Heath. They may still have a problem meeting their new, lower housing target. This would give a total of around 6,500. The second scenario should be based solely on the SHMA figure of 8,022. To be clear, the daft 10,185 target in the draft Local Plan should be dropped forthwith. Even James Radley admits the extra 2,000+ houses on top of the SHMA won’t affect house prices. As the Government position becomes clear, Hart can make the decision on which scenario can be submitted to the inspector. There is no need to Completely Concrete Hart. We lost the fight against Grove Farm because we don’t have a local plan in place. We don’t have a local plan because the Conservatives have allowed it to drift for years in a sea of procrastination driven by their internal in fighting. True, Grove Farm was lost because we don’t have a Local Plan. It was also lost because our policies are out of date and because the application was not determined on time. Yes, the Tories missed all their own deadlines. But CCH have also played their part by forcing a delay in the Local Plan last December. The main reason for taking control was to get the local plan out and to do so by a total focus and not letting the intentional disruptions from WHH to deflect us from that. At no time have we sought to delay the Local Plan. 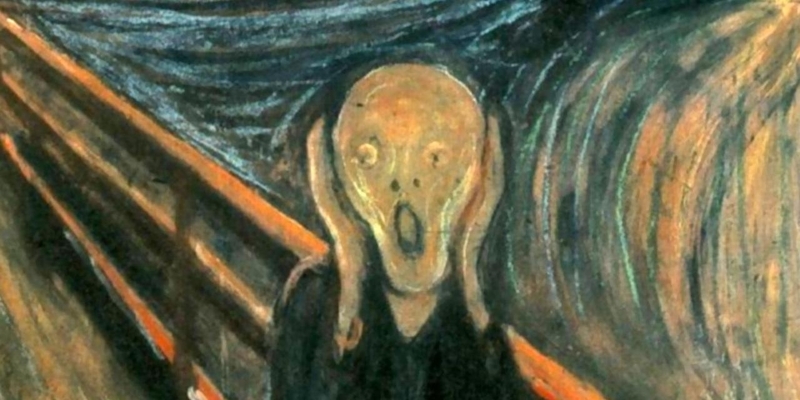 We Heart Hart first highlighted the project management and governance problems back in April 2015 and again in January 2016 after the consultation omnishambles. It is quite clear that if we don’t get a local plan out that is based on realistic and future proof housing numbers, then Fleet & Church Crookham will continue to be blighted by bolt on developments such as Grove Farm, Pale Lane and whatever is next. Yes, we need a Local Plan. And quickly. The realistic numbers to use are the Government’s new numbers. These are already future proofed by the extra houses to take account of market signals. We have suggested a modest further uplift to help out Surrey Heath. It is interesting that the Deputy Leader for the whole of Hart is only concerned about Fleet and Church Crookham. We are also concerned about Owens Farm to the west of Hook. 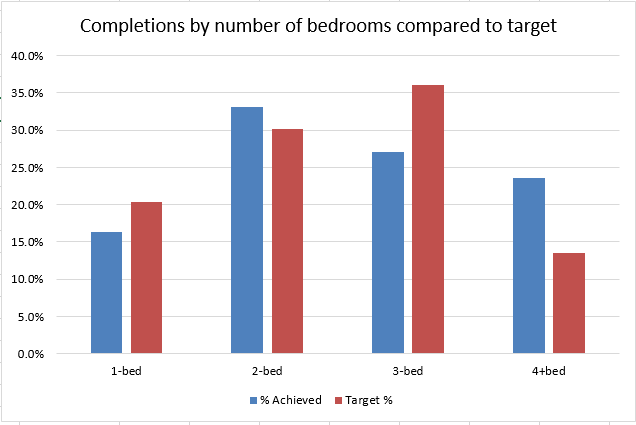 We are also concerned about the long term impact of adopting a ridiculously high housing target. This will then be compounded for decades to come, putting even more of our green fields under threat, including Pale Lane and Crookham Village. WHH know this and are trying to undermine the new settlement option in the full knowledge that they are condemning us to yet more incremental developments which do not produce any retrospective infrastructure. We are opposed to the new settlement because we don’t believe it is needed. And we certainly don’t believe it will solve the infrastructure problems facing the district. And we don’t want to Completely Concrete Hart. If we adopt the new Government housing numbers, it will be better for everyone. I hope that my brief explanation helps. It does, but not in the way he thinks. It confirms CCH is in the driving seat, dragging the Lib Dems along with disastrous policies to Completely Concrete Hart. The explanation confirms CCH is in a bunker, unwilling and unable to debate the real issues. CCH is locked into its new town ideology and is trying to justify it by sticking to a ridiculous housing target. 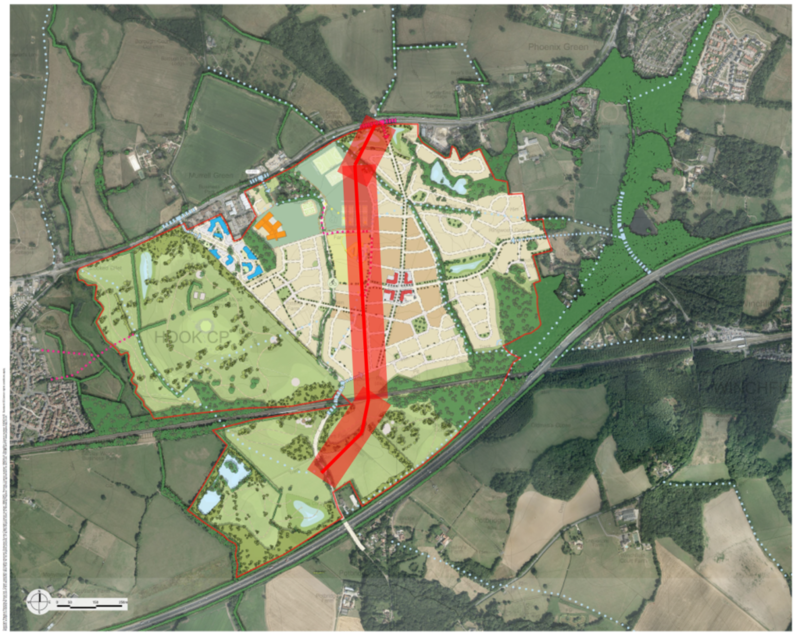 The responses to the draft Local Plan consultation have finally been published and it is clear that groups from Fleet and Church Crookham groups have failed to oppose the ridiculous housing target. Many of these groups strongly oppose the now withdrawn Cross Farm proposal that was included as a strategic site in the draft Local Plan. Their message seems to be: go ahead and build thousands of houses we don’t need, but don’t put them in Fleet or Church Crookham. 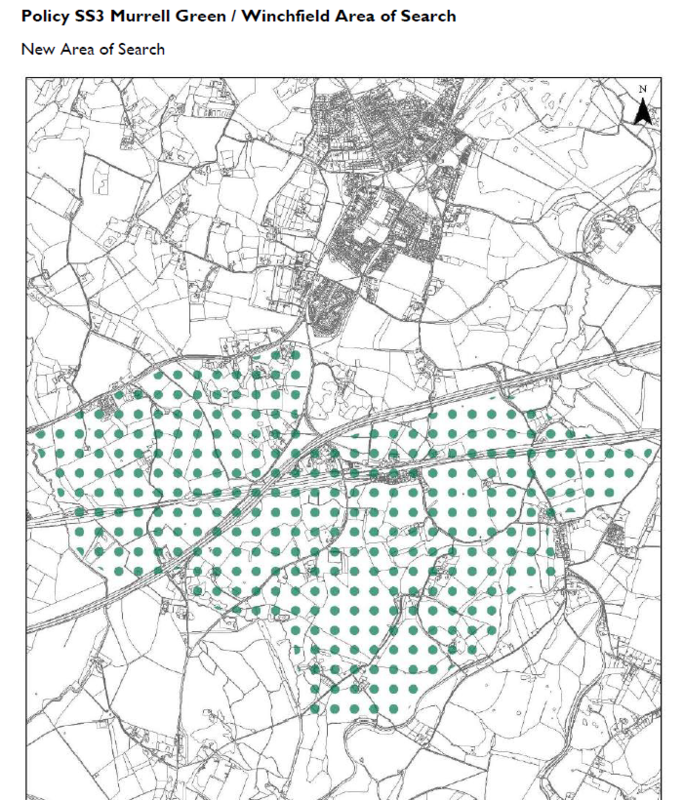 Dropping Murrell Green in favour of Winchfield East, even though the Murrell Green sites were in the area of search in the 2015 consultation (see image below) and the Winchfield East sites fared less well in testing. Removing Cross Farm from the Local Plan. This application for this site has now been withdrawn. Brian Blewett of the Liberal Democrats has also responded, supporting the position of Blackwater and Hawley Town Council and Neighbourhood Plan group. Neither of these groups opposed the housing target. As far as we can tell, Hook and Crondall Parish Councils did not oppose the housing target either. We struggle to understand the logic of this position. We can’t understand why members who purport to stand for the good of the whole of Hart support the ridiculous uplift from the SHMA total of 8,022. The Government consultation is clear, Hart’ new housing need is going to be 6.132 units. The remaining target can be met from brownfield sites alone. Alastair Clarke, chair of the Hart District Association of Parish and Town Councils (HDAPTC), also opposed the housing target in his personal response. It’s great that such a diverse set of groups has seen the logic of opposing the ridiculous 10,185 housing target. It is time all parishes and groups within Hart united behind the opportunity that the new Government consultation brings. This will benefit the whole of Hart and help stop the needless playing off of one parish against another. Minutes from the meeting have been published on the Hart website and here. The site could deliver up to 1,500 with possible potential to expand to 2,000 homes if more land were to be made available. The site is in one ownership. Only a small part of the site was within 5km of the SPA. SANG provision included in the proposal. Design and some technical evidence is at an early stage due to a change in supporting consultants. No secondary school site proposed, although a site of 5ha could be made available in line with HCC guidelines. Some areas of Common Land would need to be de-registered to provide access and re-provided elsewhere. A range of infrastructure to be provided including primary education facilities. Site has areas of groundwater flooding, but no fluvial risk. Access on to the A287. Site would provide open space, allotments etc. There would be no coalescence issues. Small scale employment provision included. The actual presentation that was given has not been published on the Hart Council website. Overall we view this as a very weak proposal that clearly is not as well thought through as the other proposals. We have read these documents and think there are significant problems with this proposal. First, the design proposals still ignore the presence of the high pressure gas main. They make passing reference to re-routing it, but come up with a cost of only £2m. This seems like a very low figure to re-route about a mile of 24″ high pressure pipeline. Second, the site is being promoted by Lightwood Strategic, which is, in our opinion quite a lightweight organisation with negative net assets. They have entered into some sort of arrangement with Crest Nicholson, but at this stage all of their promises must be taken with a very large pinch of salt. Third, they make great virtue out of the Amount of SANG they are delivering. Yet, in other parts of the document they offer up some of this land for even more housing. They aren’t quite specific, but the area they identify to the south and west of the site includes the former landfill site at Beggars Corner. Finally, the roads proposals are totally inadequate. The access to the south is over the tiny bridge over the railway line and the A30 will become a bottleneck in Hartley Wintney and Hook with the addition of 2,000 further houses between them. The other significant part of the Lightwood presentation was the legal opinion from their QC. This is clearly designed to warn other developers not to send Hart’s Local Plan for judicial review. It is also a warning to local pressure groups to let them get on with their proposals without hindrance or the Local Plan may fail, leaving Hart open to new, even higher housing numbers from the Government. Finally, Gallagher Estates and Barratt Homes made their presentation about the Winchfield proposal. Gallaghers totally ignore the electricity pylons traversing the school sites and the housing both to the north and south of the railway line. The flood risk on that land is very significant, with the site and roads flooding three times in 2016 alone. They can’t just dismiss this with a single bullet point. The roads proposals to get into and out of the proposed development are totally inadequate. The proposal includes a footpath from the B3016 to Bagwell Lane and the western part of the development which is not currently a footpath and crosses land that is not in the ownership of the consortium. Overall, we think the motive behind these presentations is for the council to be able to say it has studied all of the options in detail. Our view is that all of these proposals are unnecessary because they only arise from the Council’s insistence on setting a housing target of over 10,000 units, despite the over-inflated SHMA figure of 8,000. If we just reverted back to the SHMA figure, then none of these new settlement proposals will be required. Indeed, if we reverted to a more sensible housing target of 5,144, we could meet all of our housing needs for decades to come form brownfield sites alone. 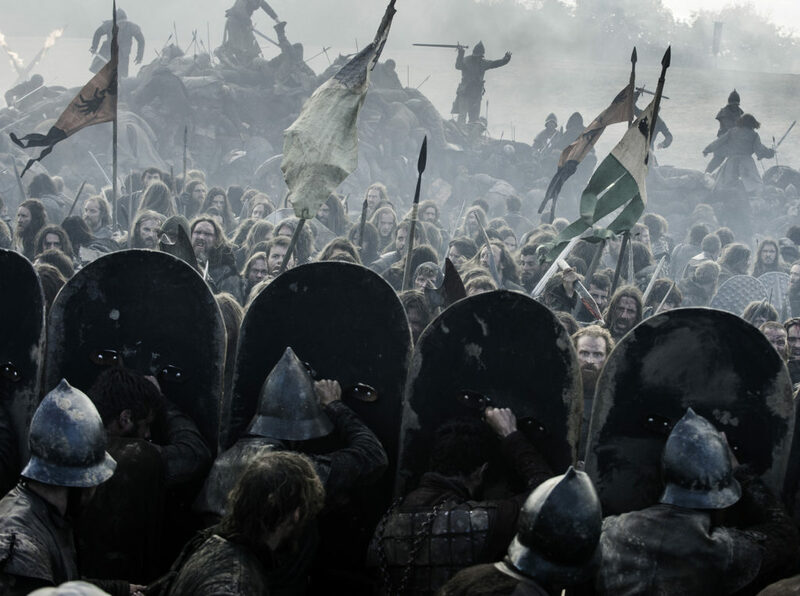 We think that there is going to be a big battle ahead. The developers are going to fight to get their proposal into the Local Plan. We will continue to fight to reduce this ridiculous housing target and get more of our housing need met on brownfield sites. Government to force Hart to increase housing target. Families living in some of the most sought-after parts of the country will be forced to accept more homes being built near them to tackle the housing crisis, the Communities Secretary has said. Sajid Javid said that he wants communities which have benefited from soaring property prices to play their part in solving the housing crisis. New rules to force councils to increase their housing targets will be published in the next three weeks. Excerpts from his speech have been tweeted. It is clear Mr Javid has in mind councils that have yet to produce a Local Plan. 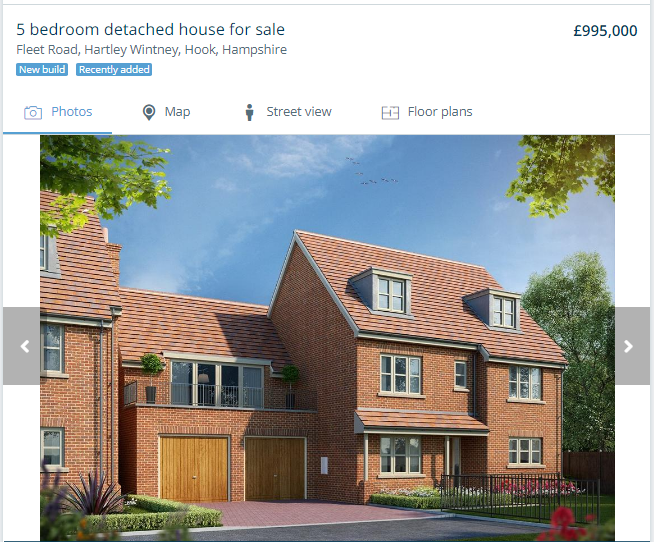 We certainly don’t need more £1m houses like those for sale in Hartley Wintney at the moment. We might also address the land-banking in the district, where thousands of houses have not been built, even though planning permission has been granted. It remains to be seen if the new Hart Council administration can stand up to this bullying from central Government. We need a lower, more realistic housing target.